Based on reviews from 26 experts and 343 users. Learn how our rankings work or see our guide to Nike Magista football boots. Updated Apr 2019. The Nike Magista boot collection was built for players who creatively lead the way to victorious goals. The playmaker lineup was unveiled in 2014 as an improved boot for fit, traction and, touch. The Nike Innovation team had designed the boot with the idea of eliminating distractions and consequently making players more ingenious. The need for a playmaker boot arose from the feedback of some of the prominent professional players such as Andre Iniesta and Mario Gotze. Thus, Magista was born. Nike has never stopped playing the game of innovations. The substantial investment they dedicate to produce biomechanically efficient shoes is evident in the making of Nike Magista football boots. The boots go through scientific processes and testing to ensure high-quality results. As a consumer, knowing these noteworthy features is a must. The Magista boots Dynamic Fit collar features a distinctly contoured sock that acts as an extension to the boot. The collar is shaped to conform to the ankles with a thicker knitted coverage. It is dipped lower in the tendon area to allow more freedom of movement for the lower leg. It extends to the forefoot with the goal of creating a boot that works with the foot and not just as a mere extension. Nike Magista Obra II DF Academy, Nike Magista Onda DF IC, and Nike Magista Obra II Elite FG are some of the Nike Magista football boots with the DF collar. The Nike Magista football boots textured upper was revamped in 2016 since it was first released. The initial launch in 2014 featured a honeycomb style that was engineered for precision in dribbling and striking. The 2016 version remained a 3D-textured upper with a slightly different form. It is a dimpled-textured style with a heat map design that is meant to visually represent the high-sensitive zones of the foot such as in the upper of Nike Magista Obra II Elite FG. All Nike Magista football boots have textured upper but variations come in the material used. Boots under the Onda, Orden, and Opus categories such as Nike Magista Onda II TF and Nike Magista Obra II Elite have textured upper in a synthetic material. The Obra boots, on the other hand, carry the Flyknit textured upper. The revolutionary Flyknit upper found in Nike Mercurial football boots is also featured in the Magista, particularly in the Magista Obra boots. The material is a lightweight, breathable and micro-engineered polyester yarn that is knitted to produce a form-fitting upper. The Nike Flyknit pixel precision properties lead to a 3D textured upper. With this characteristic, the Magista cleats that did not produce overlays nor extra weight to the boot. Distinct to the Nike Magista football boots, the stud configuration known as Rotational Forefoot Zone is patterned to improve rotational traction. It is achieved by the combination of half-conical and bladed studs arranged in the soleplate after data-focused scientific testing called FEA. Finite Element Analysis is the same method applied to the other Nike collections including the Nike Hypervenom football boots. The stud configuration is present in the firm ground, artificial grass and soft ground variations of the boot such as the Nike Magista Obra II Elite SG-PRO, Nike Magista Obra 2 DF Academy, and Nike Magista Obra 2 Elite. The Magista collection is composed of the six silo variations: Obra, Onda, Orden, Opus, Proximo, and Finale. All boots differ in the combination of their features and the quality of the materials used. 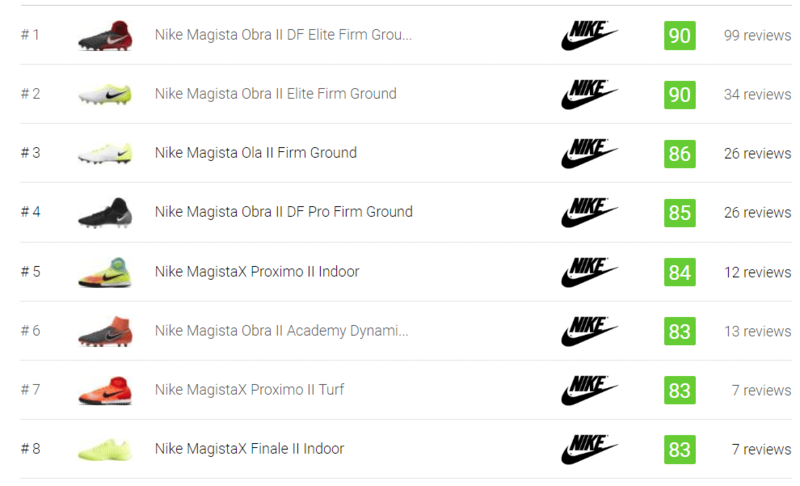 Magista Obra is the highest among the tier breakdown. It is composed of premium quality materials and several advanced innovations in comparison to the other low-end tiers. The Nike Magista football boot lineup is a mixture of boots with synthetic leather and Flyknit upper. The high-end boots such as the Magista Obra are built with a Flyknit upper while the rest of the boot categories are designed with synthetic leather. Both materials offer different sensation when it comes to fit. They also differ in several more aspects. Choosing the best upper material is a matter of personal choice. It all depends on what type of fit, sensation, and budget you prefer. The Flyknit upper may be the best choice for someone looking for a lightweight, barefoot sensation in a boot while the synthetic leather is perfect for someone looking for a leathery, slightly padded feel. It all boils down to your preference. Interestingly, the Nike Magista football boots have both of those choices on hand. Whether it’s synthetic leather or textile sensation, the lineup offers you with a selection of boots with different upper materials, rates, and technologies. What is the difference between the Nike Magista football boots released in 2014 and 2016? The most apparent difference between the two versions is the texture of the upper. The launch edition was designed with a honeycomb texture while the latter was styled with a three-dimensional heat-map-inspired upper. Both are designed with distinct upper texture, but they were all engineered for the same purpose, which is to enhance ball touch. As per Nike, both variations used the same amount of material. It means that there is no significant difference in their weight. As per player feedback, the majority felt that the second version of the upper was fit for normal to wide-footed users while the original version was perfect for small to normal frames. How do I clean my Nike Magista football Boots? Using the brush, wipe out all the excess dirt that you can remove from the upper and the soleplate. Remove the laces to clean them separately using a detergent. Place the crumpled paper sheets inside the boot to prevent the inside from getting wet. Gently wipe off the dirt from the boot by using a wet towel or washcloth. Use a brush to completely wipe away the excess dirt, especially those areas that are difficult to clean out such as the textured upper and the border of the soleplate and the upper where the mud can get stuck. Alternate the use of washcloth and brush to ensure all stains are wiped off. Clean the DF collar by wiping the dirt off with a washcloth that is dipped in water with detergent. Do the same with the sock liner. After cleaning, use a dry cloth or towel to dry the boot. Who wears the Nike Magista football boots? The launch edition of the boot was headlined by Barcelona player Andres Iniesta. Other professional players were also seen wearing the boots such as Thiago Silva and David Luiz. The 2016 version was launched by the German midfielder, Mario Gotze. Can I wear the Magista cleats without socks? Wearing the comfortable Nike Magista football boots without socks is not recommended by the majority. Its extended sock forefoot is not a substitute for a sock but rather an extension of the boot that provides lockdown. Not using socks can have serious repercussions such as discomfort with the lower leg and other areas of the foot, that can be caused by rubbing. Long high socks are recommended rather than short ankle socks to optimize your overall boot comfort. Are the Nike Magista football boots easy to maintain? Just like any other football boot, the Magista soccer boots require regular cleaning and maintenance. It is important to note that if you plan to purchase Magista boots with a Flyknit upper and Dynamic collar such as the Magista Obra II, they are quite a challenge to wash. The textured Flyknit of the Nike Magista football boots may absorb dirt and mud more in comparison to other upper materials such as the synthetic leather. The combination of brush and washcloth will do the trick in ensuring dirt is wiped off clean. It is also essential to dry the boots after washing them. The Dynamic Fit collar is non-removable and will make washing a bit difficult. To clean it, a soft bristle brush is necessary. How much is the Nike Magista football boots? The most expensive Magista boot is the Magista Obra priced at $300-$310. 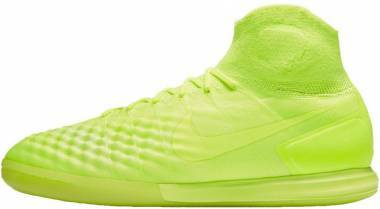 Second are the Magista Opus at $230 and the Magista Orden boots at $170. 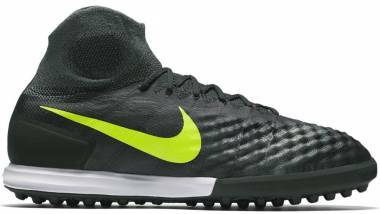 The Magista Onda has the most budget-friendly rate that starts with $90. All the prices mentioned are at the regular rates. For the indoor and turf variations of the Nike Magista football boot, the more expensive shoes are the Proximo boots at $175 while the Finale boots are at $100 at their regular rates. What are some of the notable limited edition releases of the Nike Magista football boots? Some of the notable special edition Magista boots are the following: Black History Month Edition, World Cup Edition, Academy Pack, Camo Pack, Liquid Chrome Pack, Hyper Turquoise colorway and Stealth Pack. Does Nike offer women’s edition of the Nike Magista Football boots? Yes. Nike has always been known to create women versions for their boots including the Magista. In fact, they have released special edition women’s pack for the same lineup in 2016. It includes a Black and Bright Crimson Magista worn by the American professional soccer players, Ali Krieger and Crystal Dunn. The Mercurial and Hypervenom women’s edition boots are also included in the special release. Are there any low top Nike Magista football boots? Yes. Although most of the boots in the lineup are installed with a Dynamic Fit Collar, the Magista has low-top boots. Some of the low top boots in the collection are the Nike Magista Obra 2 Elite and MagistaX Finale TF. The low top versions of the Nike Magista football boot feature an upper with a synthetic leather tongue below an asymmetrical lacing system. The heel counter is internal and serves as a cushioning and lockdown component of the boot.